﻿﻿Four Oaks Manor may bring back memories of Grandmother's house. 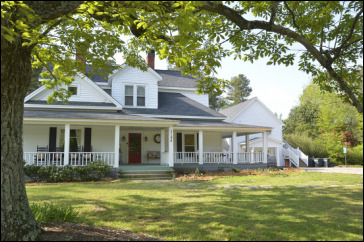 It has the charm that existed in rural areas north of Atlanta one hundred years ago. The house was built on a large farm near Buford, Georgia in 1920. The wrap around porch, six fireplaces, and large rooms created a world of relaxation and comfort that will bring a smile to your face and instill in you a sense of the sweet life that it's builder, John Crane, must have enjoyed. Today, Simple Gatherings is pleased to host events at Four Oaks Manor where you can enjoy both tree shaded areas and sunny open spaces created nearly one hundred years ago. Modern comforts have been added accordingly in an effort to preserve the qualities created when the house was built while providing the comforts required today. Here at Four Oaks Manor our priority is your loyalty. We aim to exceed your expectations. Our objective is to produce seamless events that transform your visions into reality while guiding you through the entire event planning process. Located in Buford, Georgia, we are in the metro-Atlanta area. However, the country charm preserved at Four Oaks Manor is normally only found in the mountains of North Georgia.